I Spent It wins the 2014 Saratoga Special. 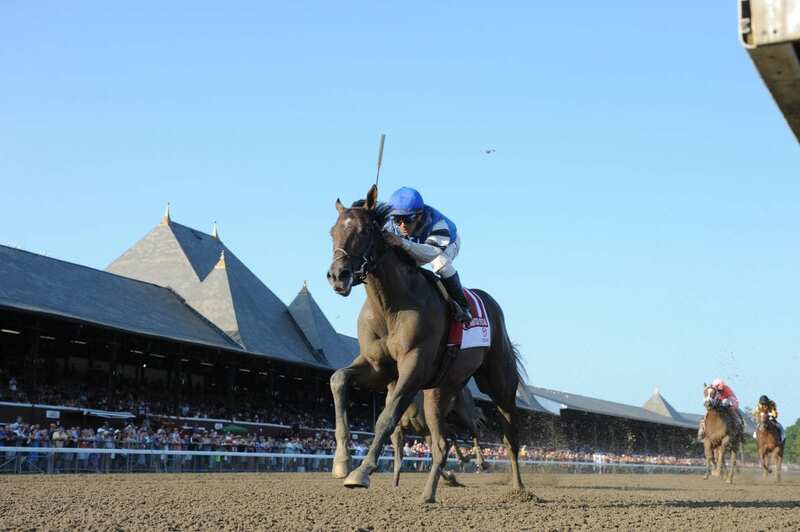 Photo by NYRA/Adam Coglianese. “From the Spa” returns to keep you up-to-date on horses bred in the mid-Atlantic racing in Saratoga stakes. Race 9 at Saratoga on Friday, August 17th features the $100,000 Skidmore Stakes for two year olds run at five and one half furlongs on the turf. Of the fourteen entries, three are Wesley Ward trainees, all of whom were entered in the Bolton Landing Stakes on Wednesday. While fillies Stillwater Cove and Chelsea Cloisters ran first and second for him in that race, Ward opted to scratch out Shang Shang Shang to run her against the boys in this race. As the 5/2 morning line favorite, Shang Shang Shang takes her undefeated record into this try and seems to be a strong entry who will give our Mid-Atlantic bred, Chase Greatness, a tough test here. At morning line odds of 12/1, Chase Greatness will look to improve from his last place finish in the Grade III Sanford Stakes earlier this meet. By More Than Ready – Salsa Star, by Giant’s Causeway, Chase Greatness is a chestnut colt bred in Maryland by Sagamore Farm, who is also the owner. Returning in the irons is Jose Ortiz, who had trouble guiding Chase Greatness in the Sanford after he broke last and was never able to rally. Hopefully, however, all this colt needed was a surface change and a workout, the latter of which he completed over the Saratoga turf training track a week ago at four furlongs in 49.38 seconds. The surface change might be the most important change for Chase Greatness since the last race though, since he has never run a turf race and seems to have adapted well to it during his work. These changes by trainer Horacio DePaz might just be enough to help him get his first win at the Spa this year with this promising colt.